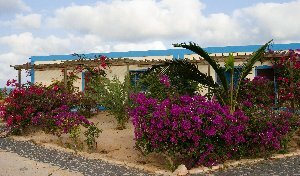 This hotel is right on the beach at Chaves, probably the best accessible beach on Boa Vista. 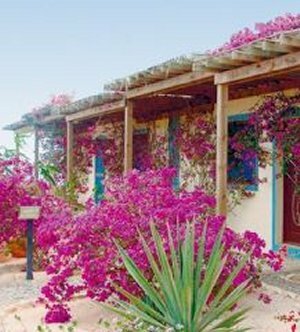 It has bungalow accomodation set around a swimming pool and a pretty garden with bougainvilleas. Each bungalow belongs to a private owner who lets it back to the hotel, so availability and interior decor are very variable. But service is good and the staff aimiable and competent. 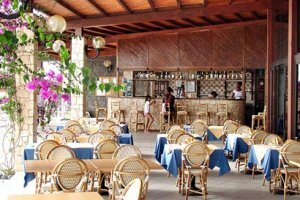 There are great sea views from the restaurant which serves some Cape Verdean dishes and mostly Italian wine. Beds are very large doubles and unusually it offers baths in the bathroom. Prices are a little higher than at the Estoril and it is further out of the small town of Sal Rei, but closer to the airport. There is a free bus service into town. The rooms with their wooden roofs can get hot and humid during the day and there is no aircon. The manager Aghostinho, trained in Panama and Costa Rica and prefers Americans or British to Portuguese. He speaks good English and is usually around to help. 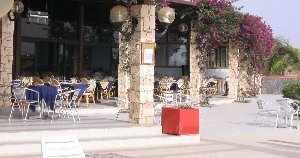 "Had a lovely time there and made really good friends with Aghostini, the manager, he`s a great lad. He mentioned yourselves and said that we were your first English customers to the hotel"
C from Switzerland was pleased. "This bungalow complex mostly belongs to Italians. The modern, spacious and tastefully decorated rooms are serviced every day, which is why they are spotless. We had a great view of the bay. Breakfast has something for everyone. Currently, there is a lot of construction in the area. But you can escape that easily by visiting the pristine, almost empty and natural white beach with turquoise water just 50m away from the hotel. " 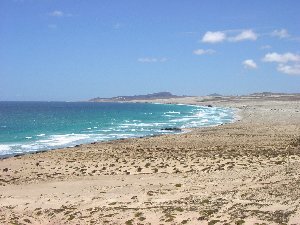 "We spent 14 days over Christmas and New Year, my husband having to share the chartering of a flight in order to join me on Boa Vista. The hotel is situated on a beautifully quiet beach , but some enormous developments taking place around the corner may spoil this peace for future visitors. 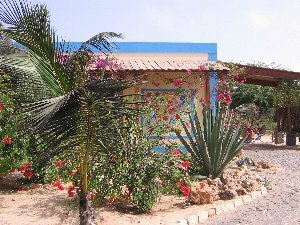 The rooms are beautifully situated directly on the beach "
"Magnificent position and conception with welcoming and well qualified staff, clean and well-kept giving an immediate feeling of well-being in a little paradise!"